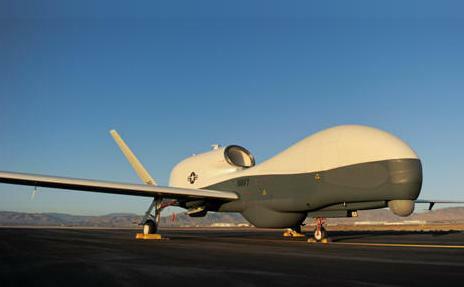 June 15, 2012 - Northrop Grumman Corporation unveiled the first U.S. Navy MQ-4C Triton Broad Area Maritime Surveillance Unmanned Aircraft System (BAMS UAS) in a ceremony at Northrop Grumman's Palmdale, California manufacturing facility. "Northrop Grumman is proud to provide our U.S. Navy customer with the MQ-4C Triton unmanned aircraft, a key element of the BAMS UAS program, representing the future of naval aviation and a strategic element of the U.S. Navy," said Duke Dufresne, Northrop Grumman Aerospace Systems sector vice president and general manager for unmanned systems. "The BAMS UAS program will revolutionize persistent maritime intelligence, surveillance and reconnaissance. We are honored to serve the U.S. Navy and our nation's allies in the quest to build and maintain a strong and cooperative global maritime domain." Designated the MQ-4C, the U.S. Navy released the aircraft name today as "Triton," keeping with the tradition of naming surveillance aircraft after Greek sea gods. Triton is the Greek messenger of the sea. Currently, BAMS-D (demonstrator), a Block 10 RQ-4 equipped with maritime sensors, is being used by the U.S. Navy's Fifth Fleet. BAMS-D provides a glimpse of the full persistent capabilities that the Triton's 360-degree Multi-Function Active Sensor (MFAS) radar will bring to the fleet. The MFAS radar is produced by Northrop Grumman Electronic Systems. The BAMS UAS program is managed by the Navy's Program Executive Office (Unmanned Aviation and Strike Weapons), Persistent Maritime Unmanned Aircraft Systems Program Office (PMA-262), at Naval Air Station Patuxent River, Md.